Earlier this year, new double-sided card designs featuring Darth Vader, Yoda and R2-D2 with C-3PO were introduced for the Disney Visa Credit Card portfolio.3 In addition, all Disney Visa Cardmembers can enjoy savings on select Star Wars merchandise purchases at Disney Store, DisneyStore.com and select locations at Walt Disney World and the Disneyland Resorts.1 Cardmembers also have the opportunity to take advantage of upcoming Star Wars-related limited-time offers. 1 Offers and offer elements including, but not limited to, participating locations, are subject to availability and additional restrictions, and may change or be canceled without notice. Must use a valid Disney Visa Card and/or Disney Rewards Redemption Card to receive special offers. Merchandise discount may not be available for certain items and at certain locations including Disneyland® Resort and Walt Disney World® Resort Operating Participant locations and any other locations or kiosks that are not owned and operated by the owners of the Walt Disney World® Resort and the Disneyland® Resort. To receive a merchandise discount, you must mention the specific offer. 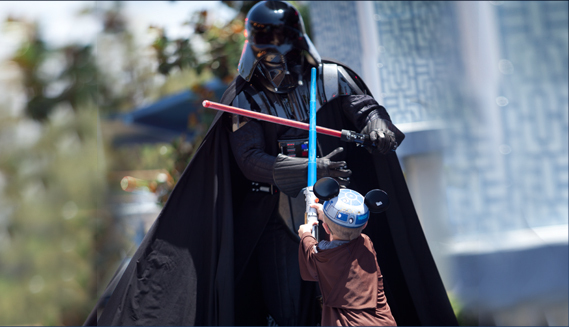 For entry into the Disney Character or Star Wars™ Imperial Meet ‘N’ Greet Photo Opportunities, must present your valid Disney Visa Credit Card. Not valid in combination with other offers, discounts, promotions or with any previous purchase. Minimum purchase and/or separate admission may be required. Offers are for personal use only and may not be transferred or resold. Please visit DisneyRewards.com/ParkPerks for full terms and conditions for each offer. Chase is not responsible or liable for fulfillment of these Disney Theme Park perks. 2 The Disneyland® Resort Character Meet ‘N’ Greet Photo Opportunities are offered daily during set hours–the Disney Character Meet ‘N’ Greet is at Disney California Adventure® Park and the Star Wars™ Imperial Meet ‘N’ Greet is at Disneyland® Park. The Walt Disney World® Resort Character Meet ‘N’ Greet Photo Opportunities are offered daily during set hours–the Disney Character Meet ‘N’ Greet is at Epcot® and the Star Wars™ Imperial Meet ‘N’ Greet is at Disney’s Hollywood Studios®. Separate Theme Park admission required for each Meet ‘N’ Greet Opportunity. Must present a valid Disney Visa Credit Card for entry for up to 6 people per cardmember account (each cardmember account may be used for entry only one time per day). Operating times, days of the week, locations and appearance of Characters may vary and are subject to restrictions and change or cancellation without notice. Not valid in combination with other offers, discounts or promotions. Offer is for personal use only and may not be transferred or resold. Please visit DisneyRewards.com/ParkPerks for additional information. 3 Card designs are subject to availability and may change without notice. Chase is the U.S. consumer and commercial banking business of JPMorgan Chase & Co. (NYSE: JPM), a leading global financial services firm with assets of $2.4 trillion and operations worldwide. Chase serves nearly half of America’s households with a broad range of financial services, including personal banking, credit cards, mortgages, auto financing, investment advice, small business loans and payment processing. Customers can choose how and where they want to bank: 5,400 branches, 18,000 ATMs, mobile, online and by phone. For more information, go to Chase.com. 0 comments to "IN A GALAXY NOT SO FAR, FAR AWAY… EXCLUSIVE STAR WARS IMPERIAL MEET ‘N’ GREET LOCATIONS FOR CHASE DISNEY VISA® CREDIT CARDMEMBERS"